It is officially summer Fashionistas and Fashionistos! Congratulations to all the lovely BU graduates! This Fashionista is rocking the perfect evening look for all of your classy newly graduate celebrations. She has edged up her little black dress, classic black blazer, and peep toe patent leather pumps with a double dose of heavy metal—but this time, in the form of ultra-modern chains. She has mixed a long, layered gold chain necklace with a cream, Chanel-inspired purse for a cool yet classy look. To touch on the current denim trend, try this gold chain necklace weaved with frayed denim by Forever 21. For a similar purse, try this accented metallic gold chain bag covered in crystals. Also check out this feathered chain necklace for a breezy Boho chic vibe. For those relaxing fun-in-the-sun beach days, slip on this subtly-chained orange bikini paired with this super sweet under the sea charm bracelet by Betsey Johnson. Cover up with this highlighter tank top and don’t forget these Gaga-esque tortoise sunglasses! Hint: Pick longer chain necklaces to lengthen your neck and make yourself look taller and thinner. Let’s not forget about the Fashionistos! Check out these amazing biker boots to add a little chain to your style. For those scorching summer rays, switch up your normal moisturizer to one with more intense sun protection like Philosophy’s Hope in a Jar with SPF 20. Gloopy lip gloss can easily melt in the hot sun, so to ensure your lip color won’t smudge try this lip stain that keeps your lips hydrated in the humidity. Also try a non-budge, no smudge mascara like Dior Show Waterproof Mascara that will stay put all day long. My pedicure pick is Sephora by OPI Nail Polish in the coral hue Cover Me In Petals and try Lancome’s Flash Bronzer for a natural looking tan without sizzling your skin. Lastly, don’t neglect your strands from the strong Summer sun! Protect your tresses with Oscar Blandi’s Capri Sun-Shield Spray. Every Fashionista has her favorite Disney princess and dreamed of being a graceful Disney princess as a little girl, complete with prince charming, her triumph over those who doubted her, and happily ever after in a humongous European castle–all with envy-inducing outfits and flawless hair. Hint: To find even more Disney wear, try scouring your local thrift store or you can even revive an old Disney sweatshirt by cutting the collar off a baggy sweatshirt to make a Flashdance 80’s style piece. This Fashionista boldly mixed and matched two spring trends: simple stripes and accent accessories–and the result is electric. She’s teamed a relaxed-fit, black and white Zara striped dress with faux snakeskin wedges. These bright wedges bring some pop to the ensemble with the firey red stones, cool blue gems, and rocker studs. For killer kicks like this Fashionista, try these similar hint of fuchsia wedges or these coral caged wedges. Also try pairing a striped dancer dress with a lively three-tiered necklace or a striped knit cami with dangling turquoise earrings or stack on a few of these upbeat bangles. Hint: Echo your daring accessories adventurous vibe in your beauty routine. Try a fierce red like Chanel Le Vernis Nail Colour in Dragon or this Dior lipgloss in Hot Pink. I believe that Audrey Hepburn is one of the most beautiful, sophisticated, and stylish women who has lived. 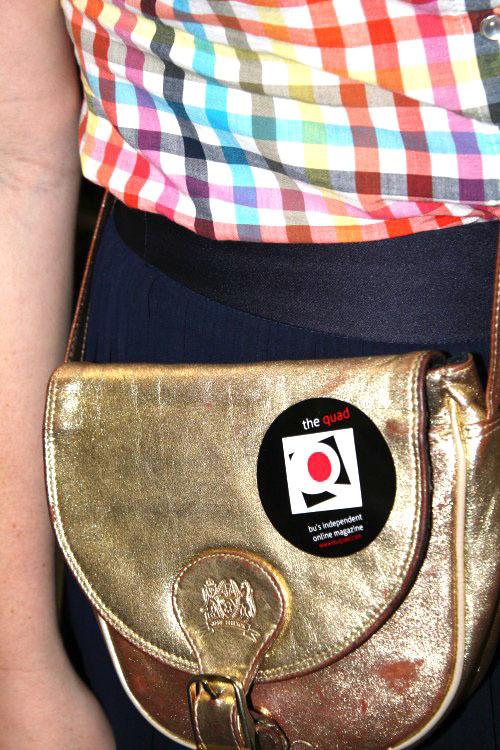 This Fashionista has channeled the fashion icon’s classic style with a bit of a modern twist. 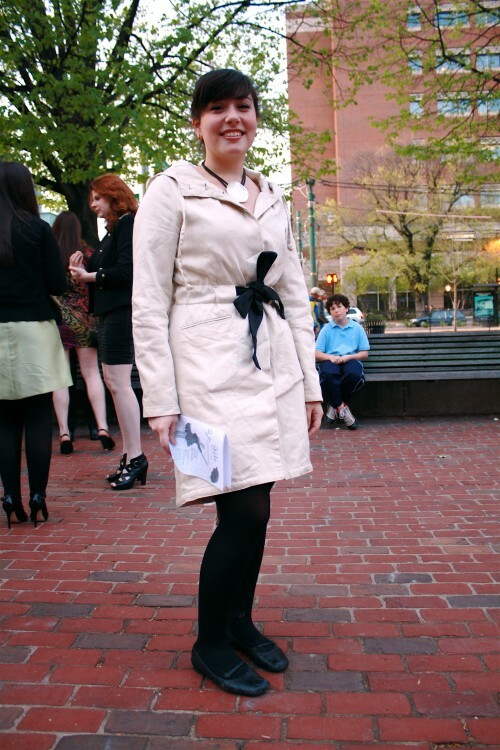 This Fashionista is wearing a sleek, cream-colored overcoat over opaque black tights with an adorable pair of schoolgirl ballet flats. Her classic overcoat has a stark, contrasting black ribbon, cinching the waist. This Fashionista’s spring trench has a surprising graphic pattern on the back. She has paired this black and white combo with a bold, mother-of-pearl pendent on a simple black cord. Fall 2010 was dominated by plaid: skirts, button-downs, shirt dresses, and coats. But try the spring translation of this trend—gingham. As this semester comes to a highly anticipated close, brighten up your wardrobe with a fun, splash of color through gingham. 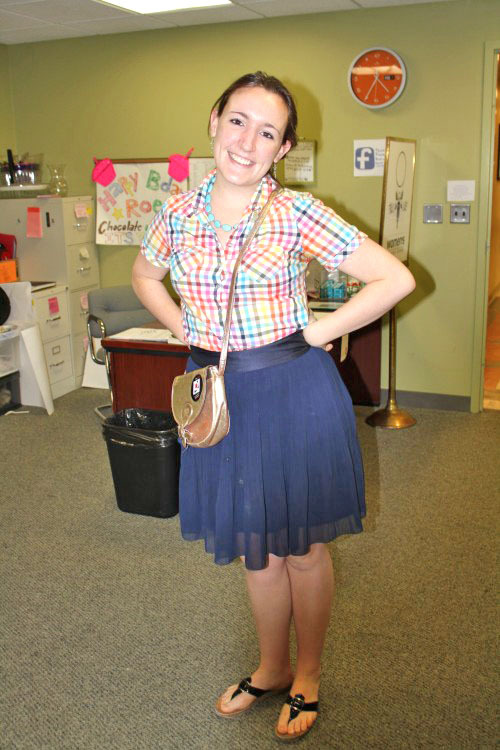 This Fashionista is wearing a gingham, short-sleeved button-down in funky fresh rainbow hues. She’s paired this vibrant top with a flared, navy skirt, patent leather slip-on sandals and a gold, cross-body bag adorned with a BU Quad sticker. Clearly, the fashions out of the British Invasion are more geared towards the black and white, mod mini-dresses worn by waif models like Twiggy, with enhanced huge eyes before Lady Gaga channeled the look in her “Bad Romance” music video. But the modern English men of the swinging 60’s also had some stellar style. This Fashionisto had that handsome, dapper look that made the girls swoon–even without the accent. 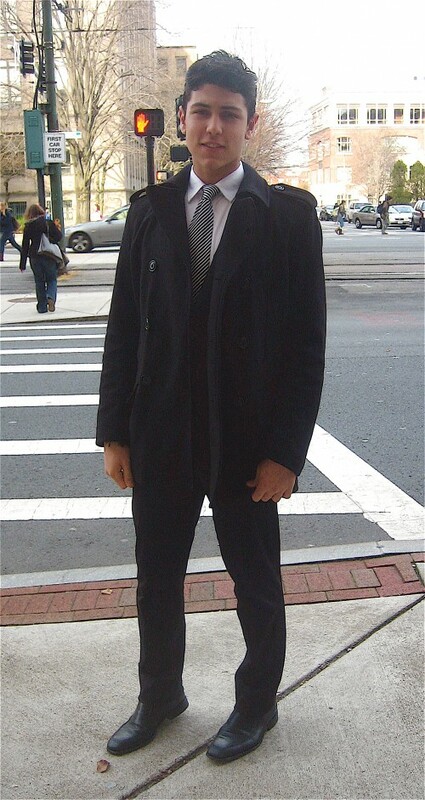 He is wearing a very polished look of a black trench coat over a crisp white button-down, classic black slacks, and leather black loafers.